Al Capone was the first American gangster to achieve celebrity status. Such was his notoriety that he appeared on the cover of Time magazine on March 24, 1930, an honor normally reserved for politicians, statesmen, scientists, movie stars, novelists or captains of industry. Capone’s ascent to stardom is the subject of Al Capone: Icon, which will be broadcast on the PBS network on Tuesday, March 20 at 8 p.m. (check local listings). This lively documentary charts his transformation from two-bit hoodlum to mobster par excellence. Commentary is provided by, among others, his grand niece, a journalist, a detective and an author. The scion of an Italian pasta maker who became a barber after his immigration to the United States, Capone was born in Brooklyn on January 17, 1899. One of nine children, he was a high school dropout who drifted into petty crime at the age of 14. He was a dishwasher and a bar tender before moving to Chicago in 1919 to work for mob boss Johnny Torrio, who took a liking to him. 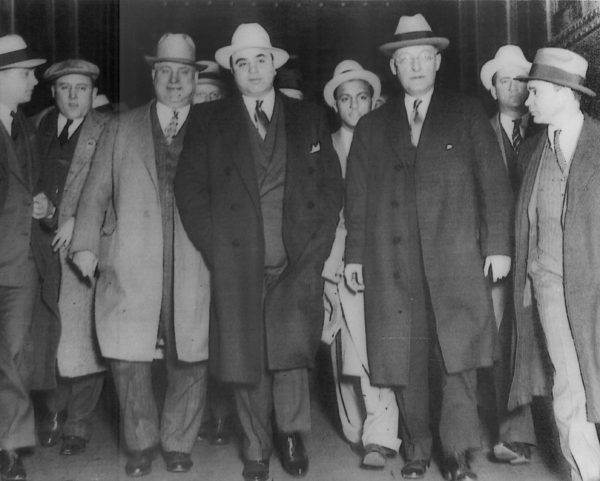 Capone’s arrival in Chicago coincided with the first year of Prohibition, which made gangsters like Torrio wealthy beyond their wildest dreams, but exposed them to the jealousy of rivals. Following an assassination attempt on his life, Torrio fled to Italy, leaving his illicit empire to Capone, his young protege. Capone lusted not only after money and women, but fame. He achieved prominence in the 1920s, when new media like radio, newsreels and tabloid journalism could turn an ordinary person into a star. Being astute, he courted the tabloids assiduously, and they transformed him into a living legend. Even the stodgy New York Times covered him, claiming he was a sociological phenomenon. 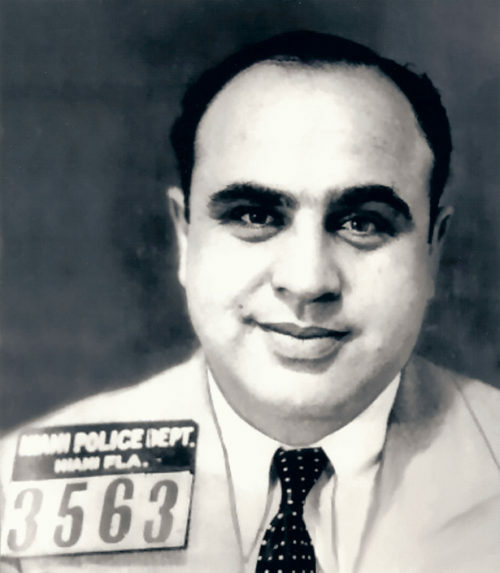 Cultivating the image of a legitimate businessman and a modern day Robin Hood, Capone donated to charities and financed one of the first soup kitchens in Chicago. The most stylish gangster in history, he was a fancy dresser, wearing double-breasted suits and fedoras fashioned from the finest materials. 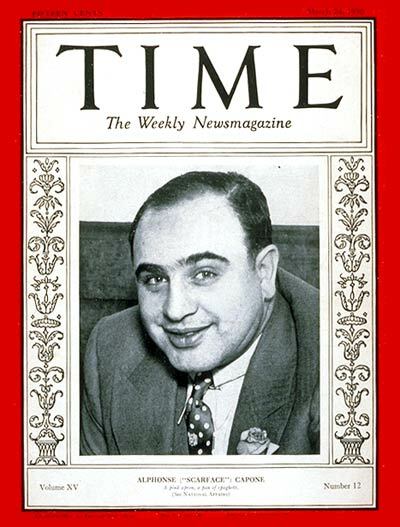 Capone’s stock-in-trade was bootlegging, gambling, prostitution and speakeasies. In his heyday, he earned $100 million annually, about $1 billion by contemporary standards. Awash in greenbacks, he bribed politicians and police, who looked the other way. His reputation as a folk hero took a serious hit after the St. Valentine’s massacre in 1929, when seven members of a rival gang were lined up against a warehouse wall and killed in a hail of machine-gun bullets. Although Capone was in Florida when the killings took place, he was suspected of having ordered them. In the wake of this gory incident, the federal government went after him. Following the money, accountants in the Treasury Department investigated his financial transactions. They discovered he had not filed tax returns, and Capone was charged with income tax evasion. Capone’s team of high-priced lawyers assumed that a two-year prison sentence would satisfy the government. On October 18, 1932, much to Capone’s surprise, he was sentenced to 11 years in jail. Capone served his time in three penitentiaries, including Alcatraz. While there, his syphilis flared up again, leading to dementia. Parolled in 1939, Capone returned to his winter home in Florida, where he died of a stroke in 1947. Seventy one years after his untimely death, Capone remains a figure of fascination, the endless subject of newspaper articles, magazine stories, biographies and movies.